You may be aware that there are certain colors that your eyes are drawn to more than others. There are certain combinations that are more appealing, while others are difficult to focus on. Of course, when it comes to deciding whether to visit a retail store, there are many factors that can influence customers decisions, and you are probably thinking color is not really one of those. But in fact, although it may not be the single reason, it can be part of an overall picture of your store that can either give a positive or negative view of your store. Think about the feeling you get walking into a store that is dark and bleak, you are not keen to stay! Whereas a light, carefully balanced in color store, with areas of interest, can help keep you in the area for longer. Using these principles, Mall Wall can help you design a highly appealing retail barricade that attracts the eye of customers who may be walking past. If you are planning to design and use a Mall Wall from retail barricade, it is a good idea to use a color scheme that stands out in a busy mall environment. It is really important where text is a priority that a careful balance of color is used in order to make sure text can be read, and your images can be clearly identified. For example, bold colors are a great choice to highlight key features including products that you would like to make a focal point, or for the text you are using to let customer know when you store will be open. Avoid lighter color for text as they may not be visible from a distance! 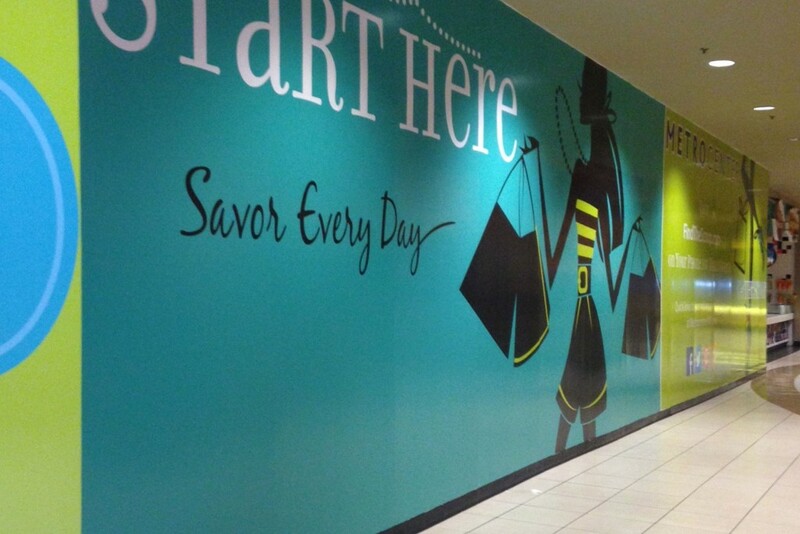 When you are using a Mall Walls retail barricade, it is also beneficial to use your branding colors. If you are moving away from brand colors, some colors are associated with certain ranges and products, which is worth thinking about so not to confuse your customers about what you offer through your retail barricade. Health and beauty is often associated with light blues and greens as thought of as calming. Purples and rich burgundy are associated with high end luxury while oranges and reds prompt a sense of urgency, and as such as often used for discount stores to encourage impulse buys. Call Mall Wall to see how your retail barricades can color your local mall!